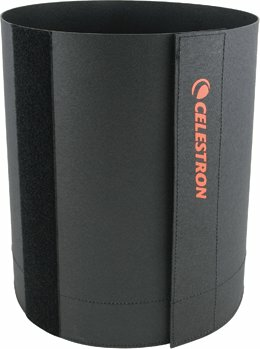 Celestron dew shield is indispensable in the wet British climate. The dew shield is an extension of the telescope tube, and, first and foremost, it prevents condensation. With its black coating the dew shield also contributes to the prevention of dispersion. Furthermore, the shield helps to keep away insects, dust and other dirty particles from the lens. Keep your lens clean and prevent dew formation! The Celestron dew shield features double Velcro, enabling you to adjust the shade to a size that fits either a C6 or C8 Telescope. The cover is easy to put on and is effective in (very) damp weather. The cover also keeps out a small amount of surrounding light which I find pretty great. The velcro band works great. I chose this dew cap because after a while I had trouble with a fogged up corrector plate. Of this cap I knew for certain that it would fit onto my Nexstar 8SE. The price is fine, certainly with the free shipping it can't be got cheaper anywhere (in Europe). The dew cap is doing its work fine, after a few nights of stargazing I wasn't troubled by a foggy corrector plate at all. Furthermore this cap reduces the light incidence, very useful if you're watching closer to hime for once.